Home Entertainment News LIVE BLOG: Watch The ROYAL WEDDING & Our Live Commentary! LIVE BLOG: Watch The ROYAL WEDDING & Our Live Commentary! Congratulations to the Duke & Duchess of Sussex! Now let’s watch this epic Royal Wedding as a family! 5am ET: Oprah, Idris Elba and his fiancé Sabrina Rhowe arrived to Windsor Castle. 6:30a: Groom Prince Harry walked in looking like a WHOLE snack. 6:48a: We just got a sneak peek at Meghan Markle in her wedding gown that looks nothing short of breathtaking! She arrived at Windsor Castle’s St. George’s Chapel via a burgundy Rolls Royce with her mother, Doria Raglan, riding with her. 6:53a: Meghan’s mother switched cars into her own separate car and walked into the Chapel. 6:54a: Camila Parker Bowles has arrived in a Philip Treacy hat and an Anna Valentine dress, along with Prince Charles in a dapper grey suit. 6:55a: The Queen has arrived! And she’s wearing lime green head to toe, a dress by Stewart Parvin, and a hat by Angela Kelly, her dress maker. Prince Philip also arrived with her, 6 weeks after his hip surgery. He looks well. 6:58a: The paigeboys and bridesmaids, incuding Duchess Kate and her children, just walked into the church looking adorbs. A colorful wedding theme it is! 7a: Meghan pulled up to the chapel in her Rolls Royce with two paigeboys in the car with her. 7:01a: She’s arrived! Her simple, yet beautiful gown was created by Claire Waight Keller, the first female artistic director of Givenchy! She was walked down the aisle, starting halfway, by her father-in-law Prince Charles. 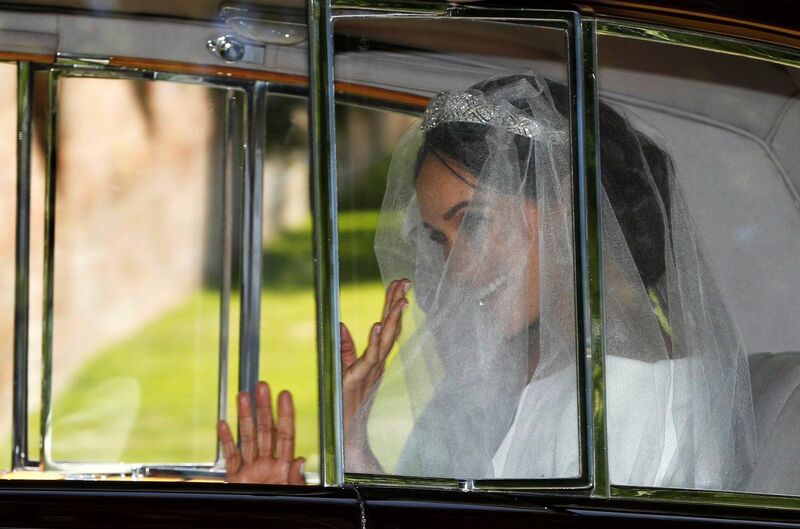 Keller also designed the veil, and it was held in place by Queen Mary’s diamond bandeau tiara, lent to Ms. Markle by The Queen. 7:10a: Those looks Groom Prince Harry just gave her tho, totally worth it! 7:12am: So you’re just gonna lie to us Serena Williams, and say you’re not going to the Royal Wedding?! She’s definitely there, along with husband Alexis Ohanian. 7:14a: Harry removing her veil was super sweet! Her makeup is very simple, and typical of her usual. Understatedly and refreshingly gorgeous. 7:15a: As Harry & Meghan said their “I Dos”, they giggled at the crowd outside who cheered. Ha! 7:20a: Meghan’s tiara is utter perfection, and almost upstages the gown. In the best way. 7:27a: Bishop Michael Curry is taking these Royals to church! 7:29a: This wedding gown train swept around this chair though. Fab. 7:58a: The gothic vibe of the church, softened by all the florals, and all this blackness up and through the musical selections. We can’t even. Perfect ceremony for the new Duke & Duchess. 8:10a: The newly married couple walked out to the courtyard of the Castle, and did a super sweet kiss for the crowd right before “This Little Light of Mine” played. 8:20a: The Duke & Duchess are on their parade procession in Windsor! And these two look head over heels in love. #WhereCanWeFindOne? Next articleLet’s Take It Back To Janet Jackson’s Most Iconic Dance Videos As She Receives The Billboard Icon Award Tonight!